Originally built for formidable European night hunting scenarios, Steiner Nighthunter Xtreme Riflescopes now deliver an unconditional performance regardless of the lighting conditions and the type of game that is being hunted. Be it North America, Europe or Africa, they can be used everywhere. Highlights of the Steiner Night hunter include proprietary Diamond Night Lens Coating that offer industry-leading light transmission, high contrast even on the edges and accurate images in the worst conditions. The feature-list is supplemented with Steiner Smart Illumination with variable illuminated red dot and battery saving auto-shutoff; Steiner Nano-Protection hydrophobic molecular lens coating to repel water, dirt, dust, snow and fingerprints; and Rubber Armoring on turret caps, diopter and power ring for protection and noise elimination. Besides, the Nighthunter Xtreme is waterproof to 6 feet, fogproof due to dry nitrogen filling; resettable to zero with the help of elevation adjustment knob, and diopter adjustable. Reticle options include 4A-1 Reticle with three posts and illuminated center red dot for rapid target acquisition. 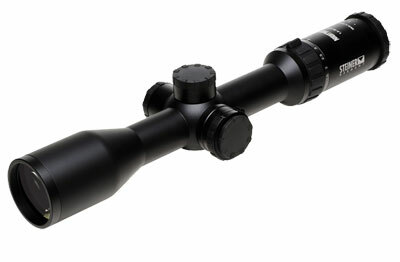 Steiner Nighthunter Xtreme 3-15x56 with an oversize objective for heightened light transmission and clarity in low light, and side parallax adjustment for sharpness and reduced sighting error. Steiner Nighthunter Xtreme 1-5x24 with true eyes-open 1x magnification for rapid, accurate close range shots and other important features to make it the ultimate dangerous game scope. Steiner Nighthunter Xtreme 1.6-8x42 with the ability to collect maximum light at the low setting, and offering better detail at the high end.